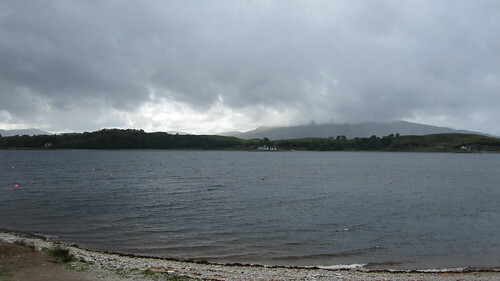 After lunch, we drove through some really heavy rain to The Pierhouse Hotel & Seafood Restaurant in Port Appin where we were greeted with “You must be Mr and Mrs Ruscoe!” and the news that we’d been upgraded to a better room because we were on our honeymoon! After dropping off our bags in the room, we both had a quiet pint of local beer in the residents-only lounge and were pleasantly surprised with a card from the staff congratulating us on our marriage. We then had a chat with the friendly owner, Nick, before getting ready for dinner. When we went back downstairs, we were given a complimentary glass of champagne and led to the best table in the house, which had been sprinkled with heart-shaped confetti! 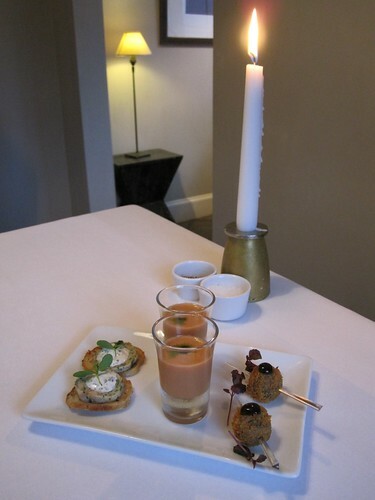 The food here was fantastic, using really good locally supplied ingredients which were perfectly prepared. 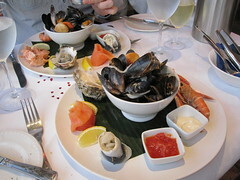 Both: Pierhouse Platter – Outstanding Seafood Caught from Lismore, Loch Etive, Loch Linnhe, Mull & Inverawe. Langoustines, Scallop, Oyster, Mussels, Fresh & Smoked Salmon, Rollmop and Fresh Bread. After dinner, we retreated to the residents’ lounge for a coffee and a Scotch. Since I’m still learning about which whiskies I prefer, Nick recommended one for me based on some others I like, so I now know that I also like Macallan but unfortunately can’t remember which one I had! 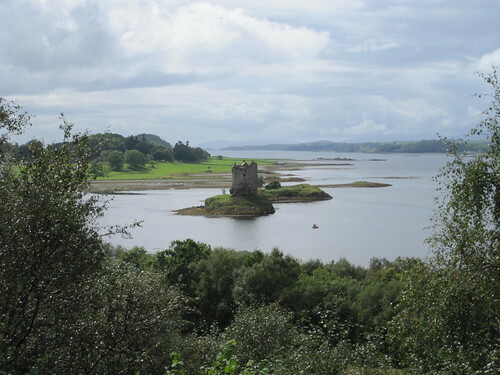 For breakfast, we both had porridge made with Scottish oats and then Suzy had poached eggs while I had kippers before catching the small ferry to the Isle of Lismore. For lunch we went to Castle Stalker View to get a closer look at Castle Stalker. 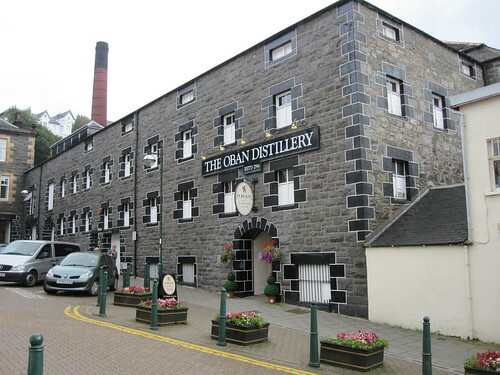 Then we visited Oban Distillery and had a taste of some cask-strength Scotch whisky during the tour before buying a bottle of the normal stuff to bring home. To give the alcohol a chance to work through my system, we took a look around Oban and McCaig’s Tower before heading back to the hotel. Although we were within walking distance of a couple more hotels and restaurants, we decided to eat at The Pierhouse again since we’d already spotted a few more things on the menu that we wanted to try. Since it was pretty much on our way to our destination, we stopped off in Edinburgh for a few hours to grab a sandwich and have a look around Edinburgh Castle. Then we battled with the city centre one-way system, with most of the roads still closed from the Edinburgh Festival and tram works, before finally getting out of Edinburgh, ditching the sat-nav, and taking a more relaxed scenic drive through the woodlands of The Trossachs heading for Balquhidder. After driving for six miles down a single track road heading for nowhere, we eventually arrived at Monachyle Mhor Hotel and were shown to our exquisite room, complete with spa bath, with just enough time to relax for a moment before getting ready for dinner in their restaurant. 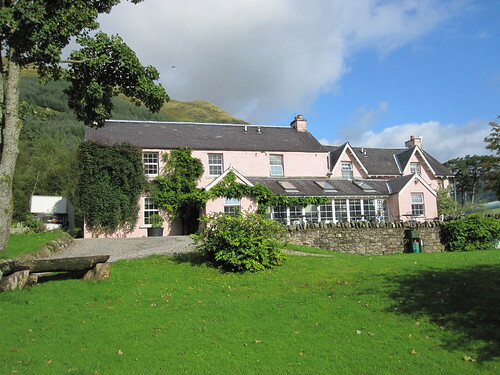 The conservatory restaurant at the front of the building offers some relaxing views of The Trossachs looking out over Loch Voil. Our table was in one of the alcoves, so felt even more special and romantic. The good service and excellent food here got our honeymoon off to a great start. It was definitely worth that six-mile drive into the middle of nowhere! Despite being pretty full from the previous night’s meal, we still managed to enjoy the wonderful breakfast. Suzy had yoghurt and fruit compote followed by scrambled egg with smoked salmon and I had homemade muesli followed by smoked haddock with poached egg. After a mooch about their garden and shop, we had a quick chat with Tom, the owner, before continuing our drive through The Trossachs, stopping at several viewpoints to take some photos along the way before having lunch at The Bluebell Café. As you would probably expect, we went on honeymoon after we got married. 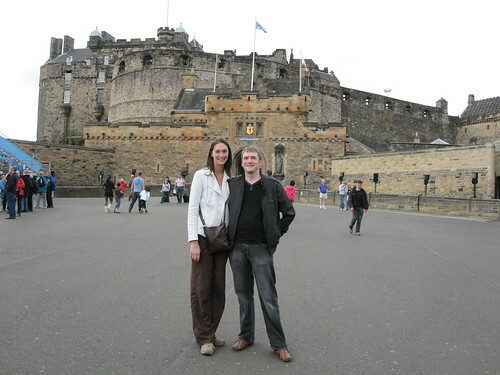 We decided on Scotland since we’d never been before and had heard great things about the food there, particularly the seafood, which we both love to eat. I guess it’s also the type of place where you wouldn’t usually want to spend a lot of money to live in luxury for the week, so it seemed like a good time to treat ourselves to something we might not get chance to do again. 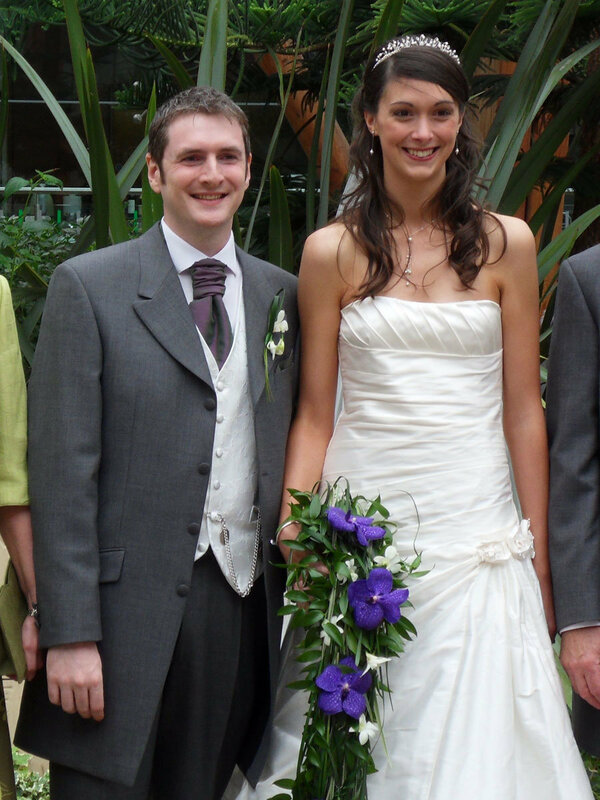 Since it was one of the few things I had to organise for the wedding, I decided to put my feet up and delegate the responsibility to a company called McKinlay Kidd who specialise in planning short breaks in Scotland. McKinlay Kidd say they include a £7 per person per night service charge in their fees which they guarantee to refund if you believe that arranging your holiday through McKinlay Kidd hasn’t met your expectations. I found that booking through them was only around £15-20 more expensive in total than it would have been had I booked with the hotels directly, so I’d definitely recommend booking through McKinlay Kidd if you’re planning a trip around Scotland to save yourself all the extra hassle of dealing with several different companies. A week or two before the honeymoon, they sent me a pack containing a touring map of Scotland, some brochures, directions and our hotel accommodation vouchers, so we were all set for Scotland! And if you’d rather just look at the photos, they’re available in my Honeymoon set on Flickr. You can view some more photos taken by our guests here, here and here. And, of course, thanks to everyone who sent us congratulations and good luck messages via Facebook, FriendFeed, Twitter, email, post and in person!